It’s all about the Money…but it’s a great Greek tradition! So its been a wonderful couple of weeks here at Special Occasion Video Productions (SOVP) HQ. We have been lucky enough to be involved in two weddings each week which were filled with culture, old traditions, an amazing atmosphere, great families and vibrant celebrations! I am of course talking about Greek Weddings. There are many aspects to a Greek wedding. But what we particularly love about Greek weddings is the money dance! There are different variations to this dance, however, they all work out the same way in the end. Let us explain; The happy couple begin a traditional dance in front of the cheering guests. 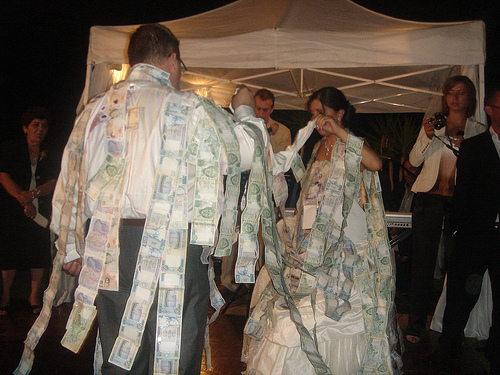 The family and friends then take it in turns to walk up to the dancing couple and pin or place a vertical chain/necklace of pinned together money notes around the heads of the bride and groom. Of course this lasts a long time, sometimes 7 – 8 minutes, and ends up being quite lucrative for the couple! It is the public display of love, generosity and sincere well wish to the newlyweds from their own loved ones; and that it is conducted in a fun and extremely confident way is what really makes this part of the wedding so memorable.